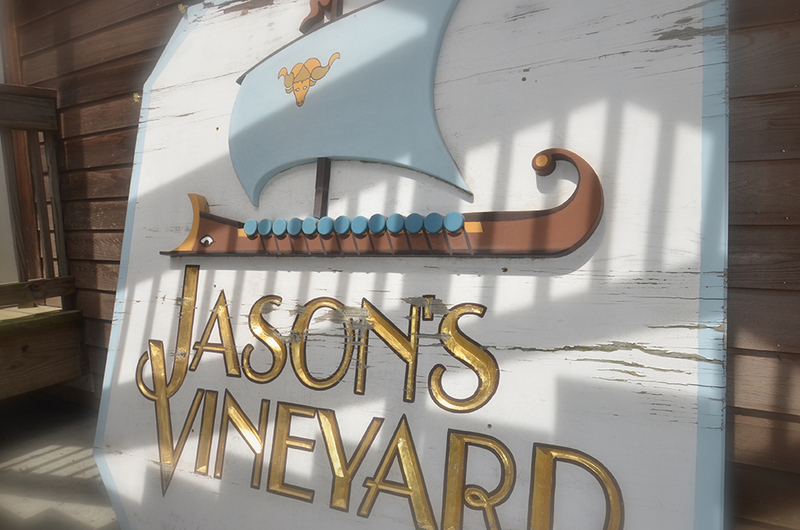 Jason’s Vineyard is in Jamesport on the North Fork of Long Island, encompassing 20 acres that he planted in 1996. But this was not Jason Damianos’s first vineyard. He had already worked at Pindar for much of his adolescence, so he really knew what it was like to work in one. Jason, an intense and determined man, spent many of his weekends and summers during high school on Long Island working among the vines, cutting, pruning, suckering, and weeding, under the tutelage of the then winemaker Bob Henn. This is where he got his first exposure to the hard work in the fields that is the essential precursor to successful winemaking. After studying business at the University of Hartford and obtaining two degrees, Jason found himself wearing a suit and being miserable. On visits to Pindar he would chat with Bob Henn, who advised him, “Jason, why don’t you become a winemaker? You don’t have to wear a suit. Do something you really care about.” The proverbial light bulb brightened and Jason went west and obtained a degree in oenology at California State University in Fresno, where he graduated with honors, followed by several years of training at the University of Bordeaux—a Mecca for wine students; he worked in renowned regions like the Médoc, Premiere Côte de Bordeaux, Loupiac and Cadillac. Influenced by his experience in Bordeaux, Jason planted his vineyard with very little space between the rows, largely to reduce the number of buds to about 30 instead of 60 on each vine, which should help promote superior fruit. Today the vineyard flourishes with carefully-selected French clones of Chardonnay, Merlot, and both Cabernets. The spacing he chose directly contradicted what the Cornell viticulturists who had come to dispense advice had told the new vineyardists of Long Island, going back to the time of the Hargraves. The Cornell team advocated nine by twelve-foot spacing between the vines. Jason remonstrated with them, saying that the soil here was different—not clay as in Northern New York, but topsoil and sand (not to speak of the difference in climate)—and he refused to take their advice. His experiences in France had convinced him that Long Island needed to look to the maritime province of Bordeaux for inspiration, rather than California, since he is convinced that climatically and topographically there are more similarities between Bordeaux and the Twin Forks than perhaps anywhere else, particularly Northern New York, so Jason planted accordingly; his vines are spaced one meter by two meters apart. 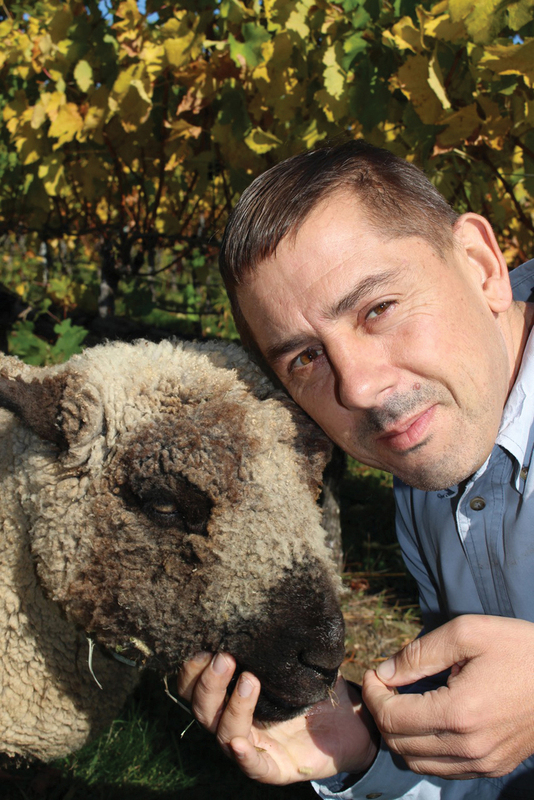 In the spirit of the Golden Fleece, Jason brought a flock of sheep and alpacas to look after the vineyard in the most sustainable way he knew. They keep the weeds down and mow, with no need for mechanical intervention and, as a bonus, they fertilize the vines. The alpaca helps ward off pests. Jason produces tightly-structured, full-bodied, and age-worthy wines that can, after reposing in a cellar over a span of time, eventually ripen into deeply-rewarding and long-lasting wines. This poses a dilemma for him since he feels the marketplace wants wines that are more immediately accessible. This dilemma is faced by a number of Long Island wineries. A compromise is not always easily obtained except by offering a wide selection of wines, some of which provide immediate and pleasurable consumption while others are for the more patient drinker who is willing to let the wine evolve in bottle for several years before pulling a cork. The tasting room as the good ship Argo, which took Jason & his Argonauts to their fate. 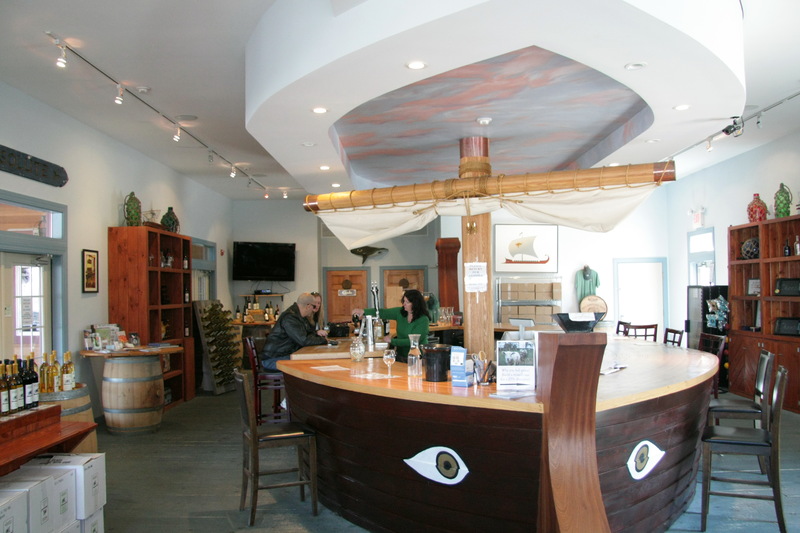 The tasting room is unique, given its abstracted representation of the ship Argo, which was sailed by Jason and his Argonauts in search of the Golden Fleece. It adds a certain rather wacky charm to what would otherwise be just another tasting room. Greek mythology, history, and literature all enjoy a large place in the Damianos panoply of Long Island wineries: Pindar, after all, is named after the great ancient Greek poet, and two of Jason’s wines are named Golden Fleece and Hercules. Tragically, Jason, 49, died after a traffic accident on December 30, 2016. His family, which is very close-knit, is determined to keep his vineyard and winery in business for the foreseeable future. After all, they also run Pindar, Duckwalk, and Duckwalk North, so they know what they are doing. Still, his loss is a significant one for the wine community. He was also director of wine making at Pindar. In January 2018 it was announced that Jim Waters, of Waters Crest Winery, has closed his tasting room and winemaking facility to become winemaker at Jason’s. Jim has long had a relationship with the Damianos family, and they have agreed that Jim can continue to make his own wine at the facilities as well for his Waters Crest wine-club members. His wine will be made in small batches for a club that he wishes to limit to no more than 500 members; there are already 400. Wine offerings may vary from this list. 5 whites: ‘Golden Fleece’ (an assemblage of five white grapes: dominated by stainless-steel-fermented Chardonnay plus Seyval Blanc, Cayuga, Vidal Blanc, Riesling), Chardonnay, Pinot Blanc, Riesling, Sauvignon Blanc, 2 pinks: ‘Andy’s Candy,’ Rosé; 5 reds: ‘Hercules’ (a sweet red blend of Cabernet & Merlot), Cabernet Sauvignon, Malbec, Meritage, Merlot; 1 fortified: a port-style dessert wine. This entry was posted in Tasting rooms, Vineyards, Viticulture and tagged Jason Damianos, Jason's Vineyard, Jim Waters, Long Island wine, North Fork AVA, Water's Crest Winery on 1 July 2018 by JoseM-L.